No business can reach success without a thorough strategy, that’s common knowledge. But do you know how to manage your strategy development process properly? If you have no simple answer, don’t worry – this question has been a subject of hot debates for decades now. In this piece, we will do a brief round-up of various opinions on the topic and figure out the steps of strategic management process. 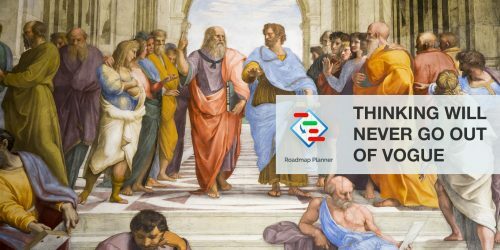 For building clear, thorough strategic roadmaps, Roadmap Planner is a must! The history of strategic management can be traced back to the 1950s-60s. Among its founders are world-famous contributors like Peter Drucker, Bruce Henderson, Igor Ansoff, Kenneth R. Andrews, and others. They introduced many of the concepts that would later become pivotal to the whole discipline. For instance, prior to this, the concept of strategy was usually applied exclusively to the areas of politics and war. It was Peter Drucker who addressed the need for strategizing in entrepreneurship as well, and for businesses to strive to know themselves. About that same time, Kenneth R. Andrews conceptualized and helped popularize SWOT analysis. The idea of analyzing Strengths, Weaknesses, Opportunities, and Threats became one of the focal points of any modern strategic management. Tying up the initial stage of the strategic management development was the shift of focus from production to marketing. Whereas previously the major concern of companies was how to produce goods more efficiently, in the 60s came the understanding that businesses should first find out what the customer wants. The so-called marketing myopia was addressed and criticized. As soon as entrepreneurs acknowledged the importance of strategic planning in business, the next obvious question arose – how exactly to conduct it? Various contributors suggested their views on this, thus forming numerous schools of thought. Let’s take a look at the most prominent ones. In 1990, C.K. Prahalad and Gary Hamel conceptualized the idea of core competencies. According to it, each organization has a field, a competency, or a resource where it excels. Businesses should focus their efforts on identifying their core competencies and strengthening them. The Design School – concentrates on designing a strategy based on a company’s internal capabilities and external possibilities. Heavily relies on SWOT analysis to evaluate all alternative strategies and choose the best one. The Planning School – again, relies on the SWOT analysis, but for the purpose of articulating the strengths, weaknesses, etc. into actionable tasks and items. Ideally, this results in explicit objectives, programs, and plans. 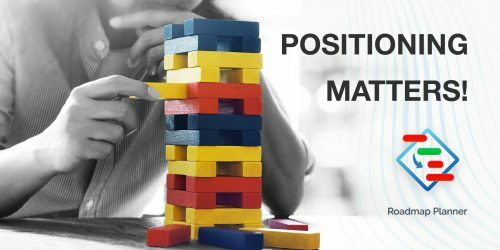 The Positioning School – tries to identify the few key strategies that best suit any given industry, and focus on employing the one that is more beneficial for the concrete organization. 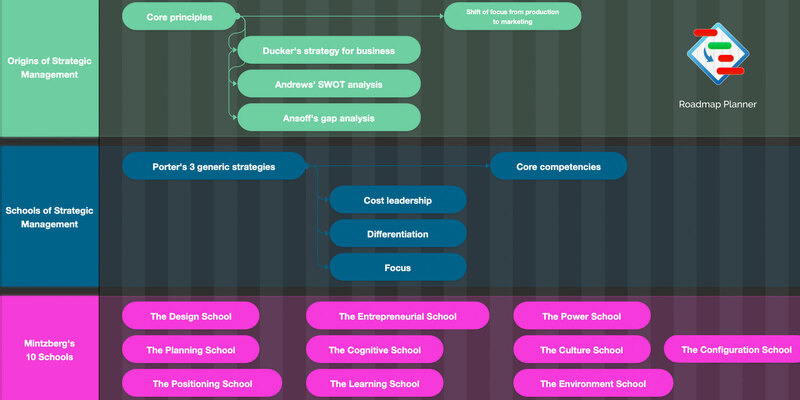 The Entrepreneurial School – a single leader with a strong vision (usually the CEO) should build the strategy. Nurturing the strategic vision in the leader and constantly searching for new opportunities is therefore key. The Cognitive School – derives its ideas from the cognitive psychology science. Its core message: the more informed a person is, the better they are fitted to make correct decisions. Thus, to even try to predict the future, a strategist should constantly be looking for new sources of data on the company’s environment. The Learning School – to come up with a correct strategy, managers should learn a lot about their organization and understand its capabilities. No experience is negative as long as something was learned from it. The Power School – being based on the political science, this school is centered around subverting competition. Any cooperation should be a non-zero sum game, and the organization’s power is the ability to influence its internal and external factors. The Culture School – rooted in the Power School, this one sees culture as the main resource of a company. Corporate culture should become an inherent part of the strategy and affect decision making. The Environment School – any strategy should be reactive to the external environment. It is the central factor and to succeed, a company should find ways to adapt to the environment. As you can see, it’s easy to get overwhelmed trying to figure out the school of thought of strategic management that best suits your organization. Luckily, while they argue on pretty much everything from who should develop a strategy to the essence of planning itself, one thing is universal to all these schools. We’re talking about the 6 steps of strategic management. They form the global template that can be used by organizations of any size and structure. Sure, certain specifics of their implementation may vary in different strategies, but the general formula will always stay the same. In this step, all the information relevant to your goals should be gathered and sorted out (this includes internal and external factors). After that, SWOT analysis is performed to examine the data and identify the promoting and impeding factors. Tools: PEST, SWOT analysis, Core Competencies, Unique Selling Propositions, External and Internal Factor Evaluation Matrix, etc. Both short-term and long-term goals and vision of your company must be clearly stated. Identify the processes that will help achieve them and evaluate the staff in terms of their ability to work on the said processes. Tools: Vision and Mission statements. Using the results of the analysis, determine what vital resources the organization has, identify where to get the lacking ones, and prioritize the tasks and issues. After that, formulate and write down your strategy in a clear and realistic form. Tools: Scenario Planning, SPACE Matrix, Boston Consulting Group Matrix, GE-McKinsey Matrix, Porter’s Generic Strategies, Porter’s Diamond, Game Theory, etc. Now that you have the general understanding of the road ahead, it’s time to figure out the specifics. Actionable, step-by-step plan, e.g. 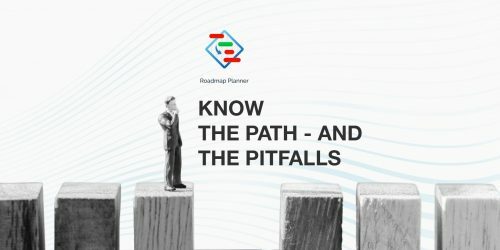 a well thought-out roadmap allows to organize your vision and convey it to all stakeholders. Once the strategy is in action, it’s crucial to closely monitor it, measure its performance, and be ready to customize it on the fly if needed. Notice that such reaction shouldn’t necessarily come as a result of negative performance – sometimes, a strategy might bear unexpectedly rich fruits, and you may want to correct it a bit to facilitate these results.